In mid of September Bahria Town management has launched a new deal in G-block, Bahria Orchard, Lahore. This is a small deal of nearly 200 plots. These are balloted plots. Map is given above. Colored area is of new deal. Bahria has launched these plots in Rs. 2,050,000/- Right now prices vary from Rs. 2,000,000/- to Rs. 2,600,000/- depending on the location of plot. Due amount is Rs. 1,200,000/- which you have to pay in 6 equal installments of Rs. 200,000/- after every 3 months. 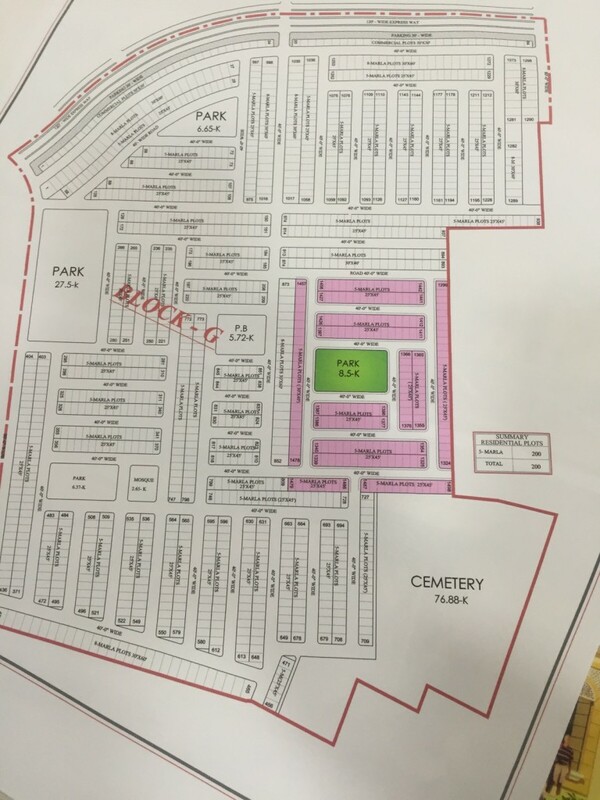 Bahria Town has started the development of South block deal in Bahria Orchard. This development has result in raise of Rs. 5 lac within 3 months. This is a very good raise on very little amount. Same thing is expected to happen in this deal as the development starts. It will take few months to start development here in G block. Though it is a very small area, it won’t take long to Bahria Town to develop this new deal area. You can contact to below phone numbers if you wish to buy or sell your plot in this new deal of G block, Bahria Orchard, Lahore.